Previous post: Happy Fourth of July, everybody! 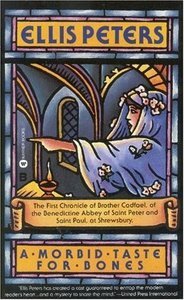 You will know Ellis Peters for her Brother Cadfael series, all twenty of which occupy a permanent place on my bookshelf, too. They are comfort reads, books I reach for at random to curl up with in front of a fire in the wood stove on a dark winter night. But. 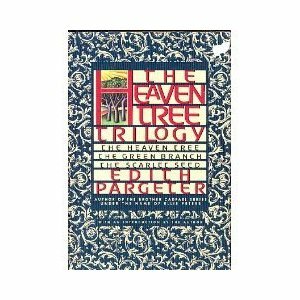 Under her real name, Edith Pargeter, she wrote three novels published in omnibus format called The Heaven Tree Trilogy, which she considered the best novels she ever wrote. So do I. The Heaven Tree Trilogy is set on the Welsh border a century before the Brother Cadfael novels, during the tumultuous reign of King John. In Volume One, The Heaven Tree, we meet Harry Talvace, an aristocrat-turned-stonemason who rebels against his father and flees to France to save his friend, Adam, where they met the mysterious Lord of Parfois. Volume Two, The Green Branch, jumps ahead to the story of Harry’s son, across the border in the court of Llewelyn, Prince of North Wales, and in Volume Three, The Scarlet Seed, young Harry’s story concludes in a civil war and the siege of Parfois, with big surprises and a thoroughly satisfying resolution. The Heaven Tree Trilogy is a marvel of an historical novel with great characters, a riveting plot and that vivid, matchless setting, the border between Wales and England that Pargeter wrote about better than anyone else. How do I know that Pargeter considered The Heaven Tree Trilogy her best work? Because after I read it, I wrote her to accuse her of having stock in Kleenex (just you wait, after you read it at my instigation you’ll be accusing me of the same thing). Amazingly, she wrote back, a short note with the loveliest little twinkle in it. I’m sorry to have caused you so much expense in tissues, and yet I take it as a compliment. I still regard the trilogy as the best thing I have done, and prefer it to all the other books, and I’m glad when readers feel the same. She died four months later. I will be forever glad I dared to write to her to tell her how much I loved her books. Her Cadfael books will be recognised by genre historians as pioneering works. Perhaps she pulled her punches when it came to describing the real muck and blood and stench of the Middle Ages…and perhaps too, latterly, her emphasis on the goodness of her characters was overdone. Even so, she redefined the form by avoiding irony in her work…and concentrating on the alien quality of the past…while at the same time pointing up the essential continuity of the human condition. And she always wrote, whatever the genre, with absolute conviction. Her card is tucked inside the pages of my copy of The Heaven Tree Trilogy, so I can moon over it every time I reread the book. I like to think that someday, after I head off to that Great Library in the Sky, my heirs will release all my comfort reads into the wild and another reader will stumble across that card, and be as charmed as I was upon reading it. But I think Edith Pargeter would like the idea that I was still encouraging people to read her favorite of all her novels even more. You will be relieved to know that I didn’t send you on yet another wild goose chase for an out of print book, because there are a ton of copies available for as little as $4 on Bookfinder.com. Believe me, it’s a book worthy of any extra effort to acquire. Thanks for sharing this. I have read the Brother Cadfael books (and loved them) but did not know of this trilogy of novels – something else to add to my “read it soon” list. That was a really dear note she sent to you – definitely someone to look up when you get to the Great Library. My list of people I hope to meet there include a famous knitting designer and a Canadian singer/songwriter; both are people I just didn’t have a chance to meet before they left us (as well as various authors and family members). And wouldn’t you just love to have your obituary include the phrase, “She was a tough old bird.” ? Hey, I still have hope. Oh, how I loved the Heaven Tree trilogy!! That’s my favourite Pargeter as well. But the one that made me kill thousands of trees worth of tissues was The Marriage of Megotta… cried like a baby over that one. I too love The Heaven Tree trilogy – I like it even more than Pillars of the Earth. I’ve also really enjoyed the Cadfael novels, and the Felse series, and the Brothers Gwyneth(?) series, but Heaven Tree is my favourite. I frequently reccommend it to people myself. I love this trilogy too, and also wrote to her to thank her for all the pleasure her books had given me. I was so glad I’d done so as she died very soon after. But I also said what I say to any author I write to, do not reply! I was abashed to get a lovely reply from dear Terry Pratchett – May he rest in well-deserved peace! – when I realised how much time my favourites must spend answering unsolicited correspondence I instead of writing or just living! So thank you too, Dana, and keep writing! Dana, as you have seen in my pics, your books have their permanent place on my shelf too. Doing the project I did for I learned so much more about Alaska. I am listening to the Kate series again, my comfort series. I have heard about the books by Edith Pargeter, but have never read any. I will be getting them for sure now.